Authenticity is a funny word, but we’ll come back to that. One of the earliest favourites from the Kent series of compilations was Mary Love’s 'You Turned My Bitter Into Sweet'. The same song was delightfully covered on this side of the Atlantic by a very young eastender called Linda Lewis. In time this cover would itself become an important object of desire as interest flourished in ‘60s Brit girls’ recordings. At the time though those soul fans that there were here didn’t want to know about the UK response to black american soul music. Yeah, authenticity is a funny word. We now rightly enjoy, say, Kiki Dee’s magnificent soulful ‘60s recordings, but at the time the delightfully uptight and snobby mods wouldn’t want to listen, even when Kiki signed to Motown. Authenticity is one thing when applied to a white girl from Bradford, but it becomes bizarre applied to black artists like ex-pats Madeline Bell and PP Arnold who recorded here, and our own Linda Lewis who was part of an important tradition of British soul music. Moving into the ‘70s Linda made a series of very special solo recordings, which placed her out leftfield, alongside say Laura Nyro, Janis Ian, and Minnie Ripperton. This series of records even surpassed those Syreeta made with Stevie Wonder. Stevie himself was a big fan of the recordings Linda made for Reprise in the first half of the ‘70s, and which mixed soul, folk, rock, and all sorts, in a wonderfully natural and pioneering way. 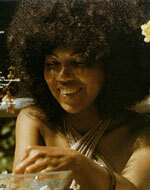 The highlight from those years remains her anthem 'Reach For The Truth', one of thee most glorious spirituals. And certainly the bond with her mentor and partner Jim Cregan worked to her advantage. Linda moved on to Arista in the mid-‘70s, and she considers that her career lost direction, with a mix of producers and writers sidelining her own skills and pushing her too far towards the all-pervasive disco sound and the charts-at-any-cost. But that may be too harsh, as certainly her Not A Little Girl Anymore and Woman Overboard sets contain some real gems, such as 'So Many Mysteries To Find' and 'The Other Side'. And while at the time she was dismissed as lightweight, she is now viewed as a true explorer, and echoes could clearly be heard in the fierce individualism of performers like Nicolette and Teena Marie. With partner Jim Cregan becoming a member of Cockney Rebel, of 'Make Me Smile' uber-pop fame, Linda was very much a part of the ‘70s pop milieu at a time when some incredibly strange and wonderful records topped the charts. In photos of the time, Linda and Jim can be seen posing with the likes of David Essex. Essex is one of the great examples of a teen idol who just happened to create some of the most incredibly inventive pop ever, pop that’s as distinctly and eccentrically English as anything by Robert Wyatt, which is a huge compliment. Essex was a relatively early champion of black British soul group, the Real Thing. He used them on his own recordings, and would take them on tour. With the best of intentions he provided them with an engagingly odd number ('Watch Out Carolina') as an early single, a number he also recorded on his great All The Fun Of The Fair set which contains possibly the greatest pop single ever in 'Hold Me Close'. While eventually Real Thing hits like 'You To Me Are Everything' and 'Can’t Get By Without You' became universal pop wallpaper, the group itself remains relatively undervalued. 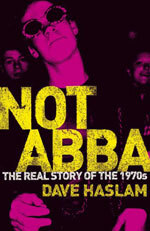 Foremost among those that have been eloquently making the case for the Real Thing as the UK’s most important soul outfit has been Dave Haslam, primarily in his Not Abba book, where he retells the ‘70s as cold, complicated monochrome reality, rather than all feather boas, mirror balls, and platform souls. It’s ground Joanthan Coe more subtly covers in The Rotters Club. A fuller text of Haslam’s Real Thing story was published in the North West Labour History Journal, which is available online if you missed it. Haslam himself is an intriguing pop figure, and like Gilles Peterson he’s one of the ‘80s underground achievers and all-rounders who actually sees things through, whether it be in promotions, DJing, record labels, writing and publishing. Haslam’s main achievement was a great Manchester-centric grassroots/underground pop ‘zine, which caught a cross-cultural moment just right, before the city went mad. The beauty of Debris was its diversity, throwing together say articles on Test Department, Blackburn buildings, Raymond Carver, paper shops, Mantronix, Ut, John Berger, Jimmy Smith, A Certain Ratio, and the Pastels. Back in 1981 the NME and Rough Trade put together a cassette collection of some of the most adventurous sounds around. The C-81 tape brought together underground pop experimentation, with the electronic avant garde, funk and jazz. A later C-86 compilation was literally a pale shadow, being a very white, very dank, very limited guitar pop set, which ex-Fall guitarist Marc Riley described in Debris as “another gravestone for modern music”. The collection studiously and stupidly ignored soul, reggae, electro, hip hop, jazz, and any sort of magnificent miscegenation. And in the same issue of Debris Dave Haslam writes about Manchester group Twang, and their “pervy disco rhythms”, joining the dots between Fats Comet and the Fire Engines. In his later book on Manchester music Haslam ignored the great unknowns like Twang and Laugh! that were inspired by urban dance sounds. The Real Thing are not intrinsically linked to the history of its city’s music either, which is daft as their 1977 set 4 From 8 is a classic document of Liverpool’s shadows and stubborn spirit. The set’s centre piece, the trilogy of 'Liverpool 8'/'Children of the Ghetto'/'Stanhope Street', is a landmark soul work, and there is an irony whereby at the time white punk rebels were being lauded for confrontational socio-realism recordings, while this soul set was the one that really reflected the world within the inner cities. And yet what perhaps better sums up the ‘70s than the story where the Real Thing were coerced into recording Biddu’s 'Let’s Go Disco' for the soundtrack of The Stud just when they could have capitalised on some Curtis Mayfield-consciousness. It’s no wonder Haslam’s text is full of wounded indignation. He doesn’t mention Linda Lewis though.